We have hair-on Boar Bok skins that just came in from South Africa. Boar Boks are South African goat. They are also known as Boer Goats. Although they are all mainly creamy white with bits of dark brown, there is some variation in color design. For example, one is all white and another is white with brown speckles, while another has a V-shape of brown at the neck. Our Gxx codes denote individual pieces. 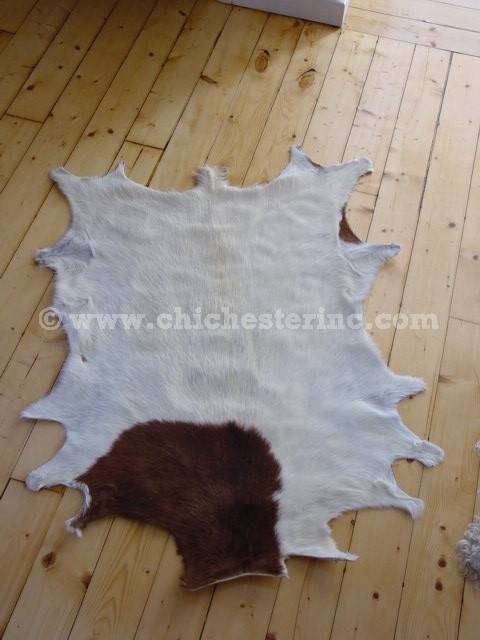 If you would like to order a specific Boar Bok Skins, please go to our Gallery to pick the exact one shown.